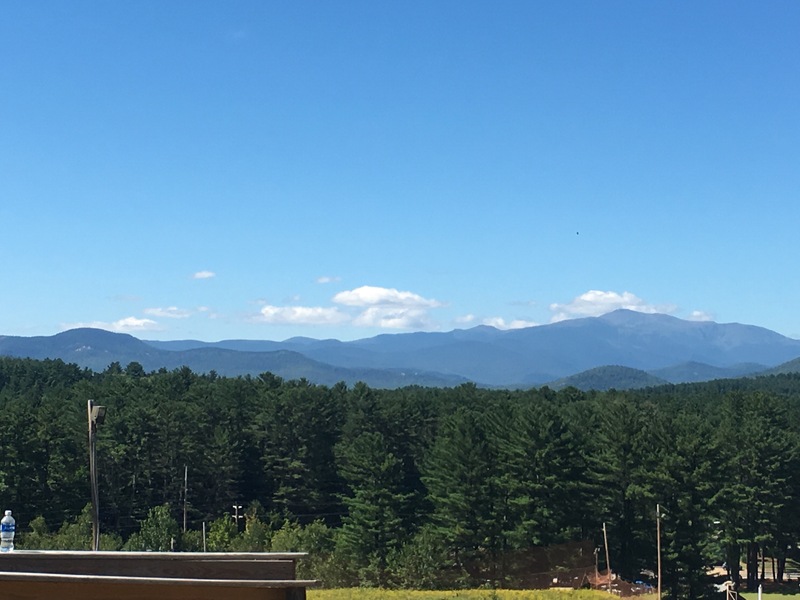 On Tuesday, I wrote about our hiking adventures in two locales: Mt Willard in Carrol County and Cranmore Mountain in Conway. 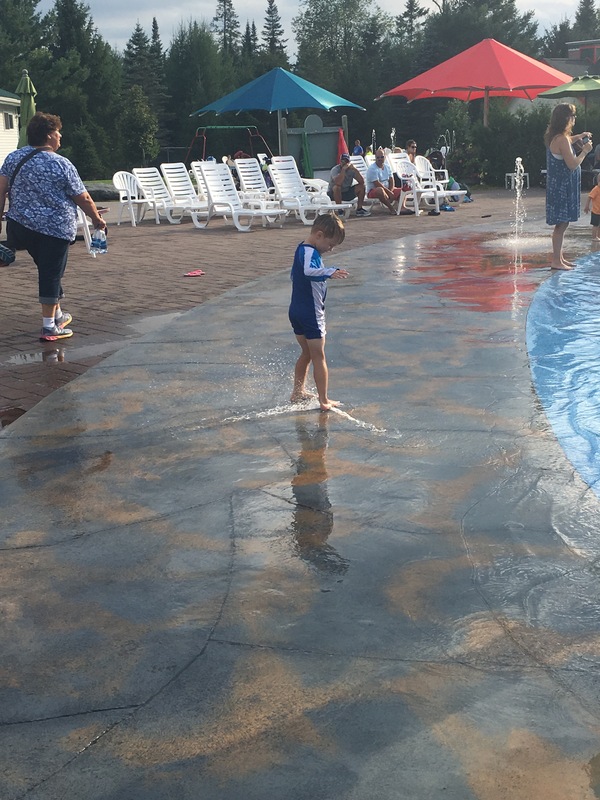 In regards to the Cranmore side of the story, it was a disaster because our kids were melting under the sun and being lost with so much real estate between us and the bottom did not improve their behavior! But when looking back at it now, I should have been melting down with them! But that day at Cranmore was more than a hiking trip (which was a spur of the moment thing at the end of the day). 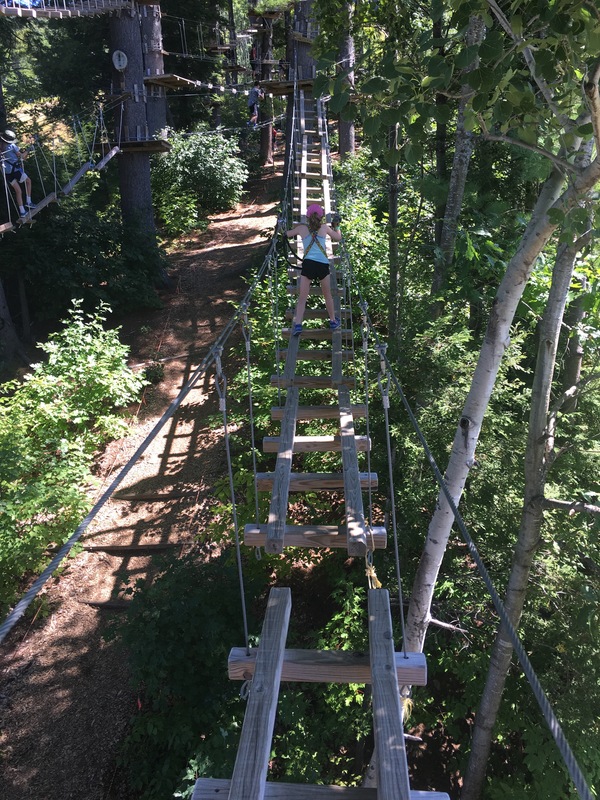 The day was actually about flying through trees, off bunge trampolines, down zip lines and tube runs as well as climbing walls! 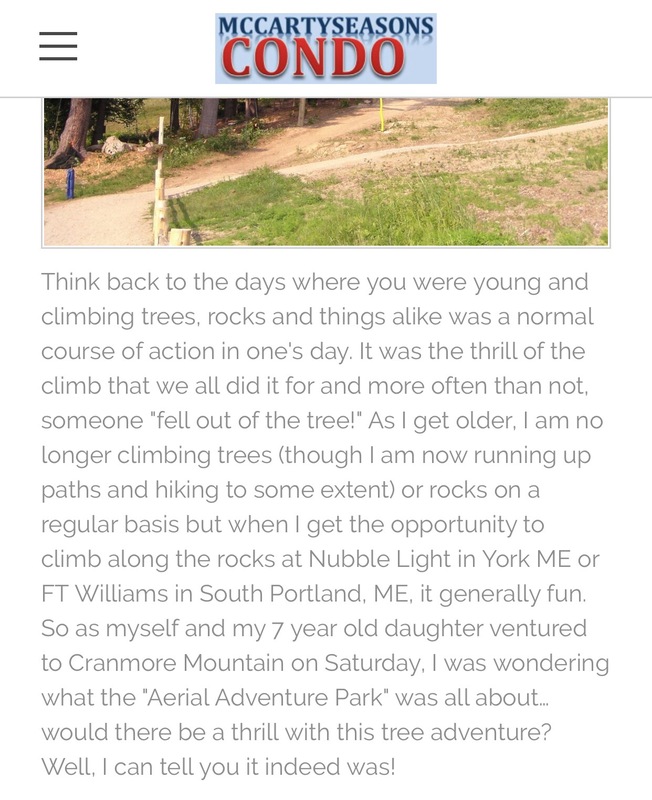 With that last review I got into some detail on the park but it seemed like had I focused solely on the Aerial Adventure park (because perhaps I had given a rundown here of each activity previously). The “AAP” is clearly the highlight of the mountain for me and the kids so it does deserve all the accolades it gets but there are other activities for the kids as well! 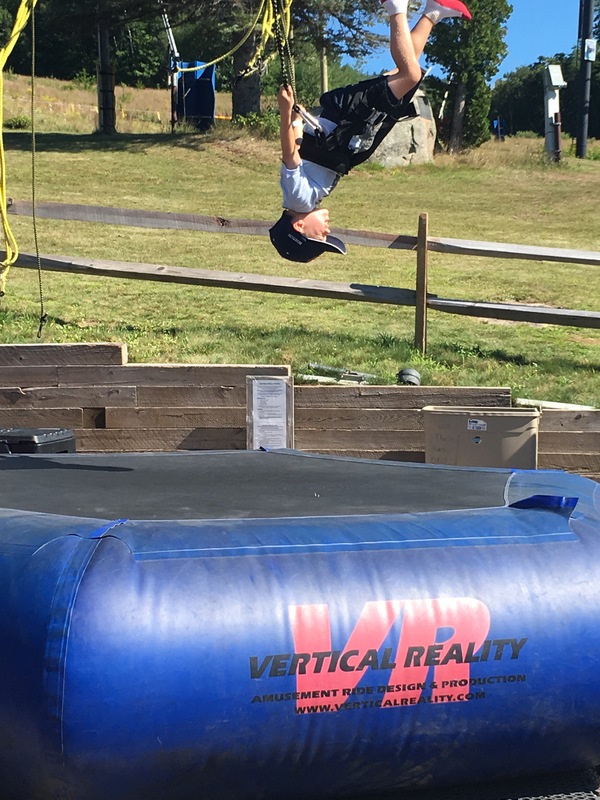 Here is a rundown of the Cranmore Mountain Adventure Park. So let’s start with the “big kahuna!” This end of the park is awesome. With Spartan sprints and Ninja Warrior all over our TVs at home these days, my kids were looking forward to this for a while and the trees and obstacles did not disappoint! While my twins and wife were on the lower levels (first time for all three of them), I was up in the “greens” with my oldest. She conquered it easily whereas I had a few issues with some steps flipping over on me (which was part of the obstacle). We climbed across wires, on ropes, did the leap of faith and more. After 2 hours, we were both really tired and forgo’d the zip lines to just head down. Overall it was awesome! (And my twins said the same thing). A few things about this adventure to mention to you before moving on. Height truly comes into play on this. If your son or daughter is smaller in size, there will be some struggles so the sizing chart that Cranmore goes off of is quite good and should not be “scoffed” at. The tutorial and staff on this “ride” are great and very helpful. One helped me as I struggled with one obstacle, talking me calmly back off the side of the ride. If it comes down to time and your son or daughter has done zip lines before, the bypass them and do a higher level (if possible). We did the harder green vs the zip lines (though she had done them last summer). So if one were to rate this end of things, it would be a 5 out of 5 ⭐️ for me! And we will definitely return to this next summer. So moving on to the rest of the park, let’s break this into two parts. First there is the agility based types of obstacles and then there is the ones that are “rides.” There is also food that is a food item to discuss and that will be at the end. So let’s start with agility! So if you are looking up the mountain, these “rides” take some agility. They don’t carry the interest of the crowds as the actual rides do on the right side of the mountain but they are pretty good still! Rocking the wall! On the far side of the park to the left, there is a rock wall located near the lift. It is no different than others I have seen but it seems much harder than the others I have done and seen! My kids like it and continue to try to do conquer it to no avail each time! Itsy Bitsy Spider…not! The spider climb is a challenge and a big challenge when it is full of kids. I have not got to that top of this ride still but my kids have and since doing such, they kind have lost interest in it. The major problem with the ride is the fact they they normally let too many on it and someone gets hurt! I think this is why my kids don’t care for it much anymore. Bungees and Trampolines. This is a fan favorite for kids who bounce up and down doing twirls in the air and other things. The lines tend to get long here from time to time because the it is a ride that everyone can basically do (compared to the others which have height requirements). If you look beyond these bullets, you will see a pick of my kids flying upside down through the air! Bouncy Housing! So as I mentioned, this park has activisties for the very small and that is where the bouncy houses come into play! My kids avoid these as they are “outgrowing” them but they have also mentioned that the houses get “burning hot” on the summer. Hot apparently equals not fun! So they is the left side of the park (I did not mentions the scenic chair ride but will do so at the end of the note). This side is generally for the younger kids and gets the job done for the most part. Still not on the Giant Swing: This is a popular ride but still not popular with me (I had issues with motion sickness on this ride a few years back). It tends to have a decent line hit it moves. The views on the ride are not bad (from what I can remember before getting sick). Soaring with Eagles via Zip Lines! This is a popular ride and one that I avoid (but not my family). It goes very fast backwards to the top of the hill and then goes full speed the other way down. My problem, with motion sickness, is the first part. Anyhow, two thumbs up from my family for this ride and its views! Summer Tubing: This is a “fan favorite” of my kids. This wet tubing ride goes about 50 yards downhill and has a good sized line that moves fast! I like this one very much as well as my kids. So we have eaten lunch each time we have visited Cranmore over the past few years at the main grill. The food is very good and the options are not bad (even gluten free options). We brought water with us to save a few $$$ but each of us each for a meal. The time it took to order however is just “weak” as it took 45 minutes for what was basically fast food service. Also the price of the food is somewhat high (about 20% more than comps I have looked at before). Well, that’s about it. Thank you for reading! Previous Post TR: Training for RTB! Next Post 5 for Friday: I am in a Funky Cold Medina! Pingback: NH Notes: Ripley Falls – BMac Running the World!